Not quite done with the holiday treats yet. 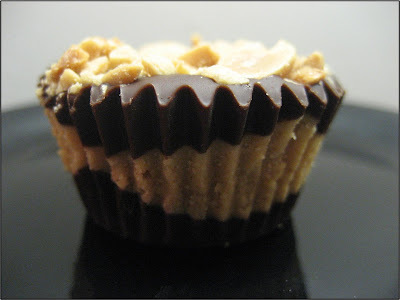 These peanut butter cups were very easy to make and are way better than any you will find at the store. This is the kind of treat that requires minimal effort, but will impress the hell out of others. A batch of these peanut butter cups would make a great holiday gift. Line 2 12-cup mini muffin pans with paper liners. Combine the white chocolate and peanut butter and melt over a double boiler. Set aside. Melt semisweet chocolate over a double boiler. 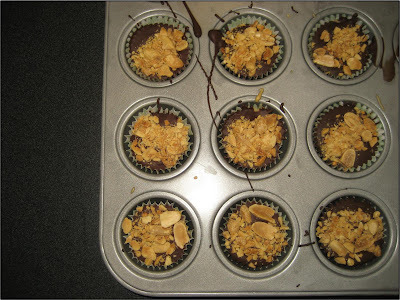 Use a spoon to layer semisweet chocolate and peanut butter mixture into liners, beginning and ending with chocolate, sprinkle top with peanuts (I lightly pushed them down into the chocolate to make sure they were set). Place muffin tins in the freezer until peanut butter cups are firm (~20 minutes). Store in the refrigerator. Bring to room temperature before serving.